24 year old Beñat Intxausti left Euskaltel-Euskadi at the end of a promising fourth year at the professional level for the even more promising environs of Eusebio Unzue's Movistar team. 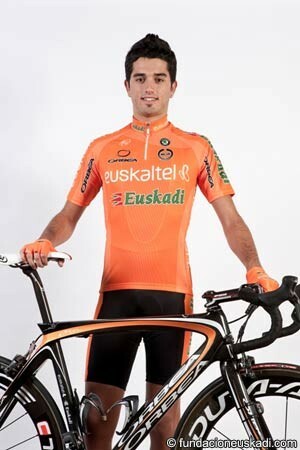 Intxausti is being hailed as one of Spain's next big talents, and while Euskaltel has shown itself to be a great team, the higher budget and profile of Movistar had to have been appealing to the young rider. Looking toward 2011, Intxausti is not rushing into anything too quickly. He's building up in a varied and relaxed fashion in the early winter before taking to the bike in earnest in the not so distant future. "I've started slowly doing sport and exercise - gym, pool, hill walking, mountain biking, and road riding," said the winner of the time trial at the Vuelta a Asturias in May to biciciclismo. "A little variety to start. The weather has been pretty bad in recent weeks, and more than anything, I ride, go to the pool, and go to the gym. I've been riding three or four times a week on the ride for about two hours." For a rider like Intxausti, who dazzled at the Tour of the Basque Country and showed glimpses of brilliance throughout the season, the goal is, unsurprisingly, to build off of what he has accomplished so far, and hopefully reach hitherto unreached heights. "The ambition is to continue as in 2010 and improve, win more races, and make progress - go to the races to fight to win, especially at home. I would like to repeat my performance at the Vuelta al Pais Vasco." While Intxausti has shone well in the shorter stage races, the three week Grand Tours have not gone quite as well. Intxausti did not finish the Vuelta in September, and took 60th overall in his first Vuelta the season before with Fuji-Servetto. With that in mind, Intxausti is not making any wide, sweep proclamations about his potential just yet. "So far, I can't say much about the three week Tours, I've only done two, and this year I withdrew from the Vuelta. I think can perform better, but I'll have to prove that. The one week tours like Paris-Nice or the Basque Country suit me with finishes in the mountains and shorter time trials." The result at the Vuelta al Pais Vasco was without question the performance that Intxausti can hang his hat on at this point. The young Basque admits that the result in April changed him as a rider and paved the way for another big result just a few weeks later at the Vuelta a Asturias. "From there, I changed, then I won the time trial in Asturias and fought for the overall classification. I'm happy with the step I made." With the promise shown in April and May, there was much excitement about Intxausti's potential in the final Grand Tour of the year, the Vuelta a Espana. However, the Vuelta went anything but as planned for Intxausti and his Euskaltel team in general. "The first part of the Vuelta was good, almost excellent. The second part, however, did not come out as I had wanted, but we must continue on. I have not made an accurate conclusion, perhaps I had a virus at the start of the Vuelta, because I was pretty good [before that]." With the absence of Alejandro Valverde, Movistar will lack a true, full-on leader next season, but Valverde's suspension should allow Intxausti the chance to shine when he otherwise might not have gotten it.